Variable speed and clutch systems on the farm have two new energy-efficient drive belts available. 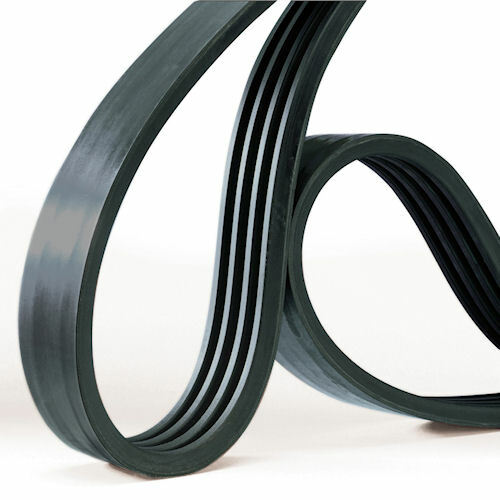 ContiTech AG's Power Transmission Group has unveiled a pair of new drive belts for the agricultural industry to further enhance its lineup of farm-related non-tire rubber products. The new Conti-V Varispeed wide v-belt was specially developed for the variable speed drives used in many farm machines, while the Cont-V Multibelt is designed for clutch drives. Both products are heavy-duty belts that offer high energy efficiency and a virtually maintenance-free life. ContiTech has a new belt for variable speed drives and one for clutch drives. Both are engineered for engineered to be virtually maintenance free and highly energy efficient. To transmit high power safely, the EPDM-based Conti-V Varispeed belt has a low-stretch aramid tensile member, and is temperature stable from 30 – 140 degrees Centigrade. The high-performance Conti-V Multibelt features a friction-reduced texture to ensure gentle and silent clutching. The Multibelt has high lateral stiffness from a transverse cord design to allow for safe transmission of large loads. For more information visit www.contitech.de .